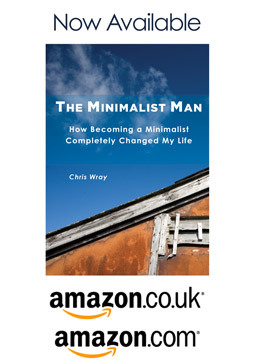 Here on this blog I give tips on living a minimalist lifestyle for those seemingly few minimalists in the UK. If you want to just skip to the main content then take a look at the Blog Pages. ‘Two Less things’ – whats all that about ? Two less things is a minimalist phrase I discovered, firstly when looking for a decent name for this minimalist website and secondly as part of the minimalist process of removing the things from my life. Generally speaking, things seem to come in twos. Getting rid of one thing, seems to lead easily to getting rid of another. Something perhaps along the lines of getting rid of one shoe, when actually they come in pairs. I’m sure there’s lots of examples other than this, but I’ll update those when I think of them. So what is this minimalist blog all about ? Well there don’t seem to be a lot of minimalists in the UK, ( awaits masses of contacts telling me I’m wrong ), but the ones out there do tend to be a little ‘new age’ in my view and minimalism is generally a secondary part to one of their main characteristics. So for example travellers who travel very light, one bag perhaps and never have a home. For me minimalism was about removing both physical things that I found turned into a burden, and then expanding on that and removing e-mails, to-do lists, action items, responsibilities, roles I’d rather not have, and again the two less things came about naturally, almost a “one thing leads to another” when you let go of things. Its important to point out that I still have somewhat of a ‘normal’ lifestyle. I live in a normal house, in a normal street, with normal children. I own a normal car, and have normal rent and bills to pay. To all intents and purposes I’m as normal as you, if there is such a thing. Where I differ, is that over the last few years, and through perhaps some less than normal events, I arrived at the conclusion, that having more ‘stuff’ just doesn’t make you happy, and in fact in the long term it does the exact opposite and makes you pretty sad, more than sad in my case. So through this combination of events I arrived at the point where enough was enough, and the ‘stuff’ just had to go, along with a whole lot of other non-physical stuff, like lists, and commitments I hated, and putting up with nonsense. Funnily enough, when I started searching, I found that a few other people had reached the same conclusion I had. They didn’t think much to stuff either. Most of them live in the US, so I thought I’d perhaps add a UK Minimalist view to theirs…. and the rest as they say, is history, and the Two Less Things blog was born. Head over to the contact page and let me know you dropped by. Send words of encouragement, and I’ll write more. Then pop back again in a few days and you’ll find something else to comment on. Hi I’m Chris, author of the Two Less Things Blog. Thanks for visiting the site and I hope it helps you on your journey to minimalism. You are welcome to browse and comment as you see fit and if there’s anything else I can help with drop me a note on the contact page. Why not download my free eBook while you’re here.